Trans-Ferir: Ciência, Tecnologia e Fascismo - tema oportuno! Ciência, Tecnologia e Fascismo - tema oportuno! 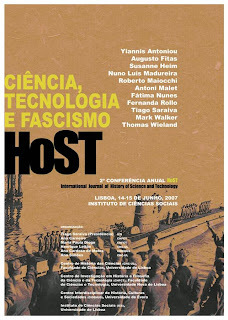 The current workshop brings together historians of science and technology to discuss the polemical relation between technoscience and fascism in the twentieth century. Along with the more traditional aim of trailing the changes in scientific practices following the establishment of political regimes labelled as fascist we wish to explore the crucial role played by technoscience on conceiving and materializing totalitarian dreams of new social designs. By shifting the centre of attention from antiscientific practices to the work of the many scientists mobilized by the State for the construction of a fascist society, historians started to produce by the end of the 1980’s new accounts of the importance of laboratories in Nazi Germany, Fascist Italy and Franco’s Spain. As scientists and engineers adapted their practices to the opening up of opportunities as well as the imposition of restrictions by the new rule, political dreams were enlarged by technological innovations and laboratory work. Although the copious literature produced by the research program fostered from 1999 to 2004 by the Max Planck Society on the “History of the Kaiser Wilhelm Society in the National Socialist Era”, already offered a complete renewal on the understanding of science and Nazism, a more general comparison with other fascisms was never tried. If political scientists dealing with fascism are progressively more akin to comparative perspectives, historians of science and technology have not yet faced the challenge of confronting simultaneously different fascisms. By bringing together scholars working on Germany, Italy, Spain, Greece and Portugal, we thus hope to make the history of science and technology more relevant to the general understanding of fascism. 4) Comparing Technoscience Practices: fascism in different countries, fascism vs democracy, prefascist vs fascist. MEMBERS: Ana Carneiro (CHFCT/DCSA, Faculty of Sciences and Technology - New University of Lisbon); Maria Paula Diogo (CHFCT/DCSA, Faculty of Sciences and Technology - New University of Lisbon); Henrique Leitão (CHCUL, Faculty of Sciences – University of Lisbon); Ana Cardoso de Matos (CIDEHUS, University of Évora); Ana Simões (CHCUL, Faculty of Sciences – University of Lisbon).